Polyurethane concrete raising, also called Poly lift or Poly lifting, achieves the same leveling results as traditional mudjacking with a lightweight material that requires smaller and fewer injection holes. The drill hole size is a huge factor especially with our patching you cant even tell its had work done and the “potential” to drill less holes. The fact it is waterproof and where we live it rains 11 months out of the year. The weight difference is extremely significant especially on jobs we are using over 400 lbs, the weight difference between 400 lbs of poly and 4 CY of mud is a huge factor. Completely waterproof. With the damp climate we live in, the mud option is more prone to wash outs over time, where the polyurethane is one solid piece of structural foam supporting the slab. Lightweight. The polyurethane is 50x lighter then the mud/slurry option, so you wont be adding extra weight to an already failed sub-grade. Clean up / Hole patches. The polyurethane method offers a much cleaner alternative, with hole patches 1/3rd to 1/4th the size of the mud hole patches. 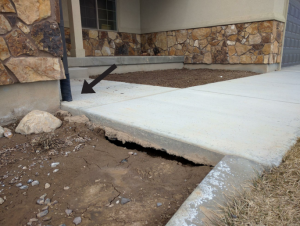 If the drainage problem which caused erosion and ultimately settling in the first place is not addressed, there will be additional erosion and settling regardless the material you use to initially fill the void(s) and raise the concrete slabs. This is why our sales staff are trained to recognize these drainage concerns and have them addressed prior to our work being completed. This allows us to provide a permanent solution through the PolyLevel product. Polyurethane is high density structural foam that combines two liquid chemicals at the injection nozzle and will naturally find any and all voids. After about 20 seconds it begins to react and expand. For Poly we use a 5/8″ drill holes which is about half the size of the mudjacking holes making the holes less noticeable. With Poly, there is also the possibility we can drill less holes because the material is more fluid as it is injected allowing it to find the void(s) more easily. The Poly material is fully cured after a period of 30 minutes, allowing you to immediately park your car on the concrete slab if we are raising your driveway or carport. The fast curing of the material is another huge benefit of the polyurethane option. Poly is also waterproof when fully cured and will not wash away. In addition, the lighter weight of the material is also an advantage. Per cubic foot the polyurethane material is 2 pounds versus the slurry is 100 pounds. Why is Polyurethane better than Mudjacking? One downside with the mudjacking materials, is that it adds weight to an already failing sub grade. Takes much longer to cure / set up because water is added to make the mud material fluid enough to pump beneath the slab(s). Polyurethane is light weigh and does not add to the weight nearly as much. For mudjacking, the minimum hose and hole size for the mud product is significantly larger in order to allow the material to be pumped beneath the slab. This results in holes and patches which are highly visible once the work is completed. There is no avoiding residual material around the work site when using mud and often it is difficult to completely clean the area after the work has been carried out. In some cases, if there’s ongoing erosion as a result of a drainage issue, the mud may continue to be washed away with the original sub soil as well.